It's been a quiet week here at Weather5280, we hope and trust you all had a safe and very happy New Year. Colorado's weather pattern has been pretty nonchalant, with several quick hitting waves of energy bringing quick shots of snow to the state, but nothing too significant for the Front Range in several weeks. Temperatures will warm up nicely to finish the week. Morning lows on Thursday were in the upper teens to near 20 degrees across the metro area and will climb into the lower 50s Thursday afternoon for many locations. Friday will be even warmer, with many locations flirting with 60 degrees before colder air begins to push back into the region Friday night. Our next chance for snow will come Friday night and Saturday. 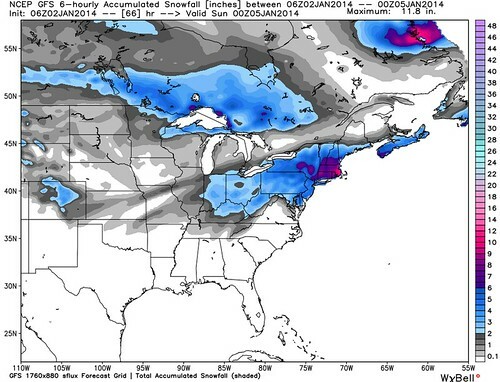 This chance for snow looks marginally better than the last four or five systems. We could be expecting totals in the range of inches, rather than a trace to inches. We'll keep you updated over the next 24 hours or so and see how models progress, but it's something to keep an eye on as we head into the weekend. With the weekend weather, temperatures are expected to fall from near 60 Friday, to 30s Saturday, to 20s Sunday. Overnight lows will drop into the teens Saturday night, with single digits possible for a few locales. Snow moves out by Sunday, but chilly temps will linger into early next week. The dominant weather pattern across the United States has kept most of the cold and snow out of the west over the last several weeks, but it's been full-force winter across much of the central and northern United States. Today the cold and snow marches east, with the northeast bracing for a shot of moderate snow and wind as we head into the later hours on Thursday. 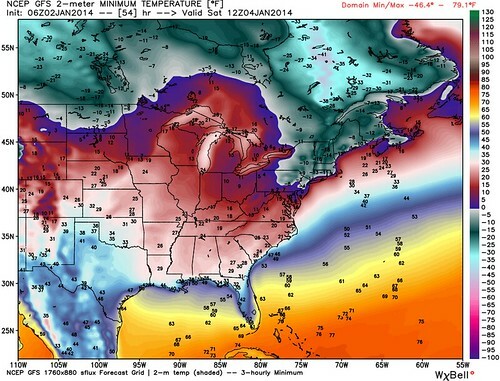 Behind the snow will be some of the coldest temperatures in years for the big cities in the east. New York City may drop below 0 degrees Friday, behind the currently issued Winter Storm Warnings and blizzard warnings.